Visit my new site and enter a GIVEAWAY! Made by Melissa has moved to www.madeinmelskitchen.com! Come take a look at my new site, update your readers and enter the GIVEAWAY! 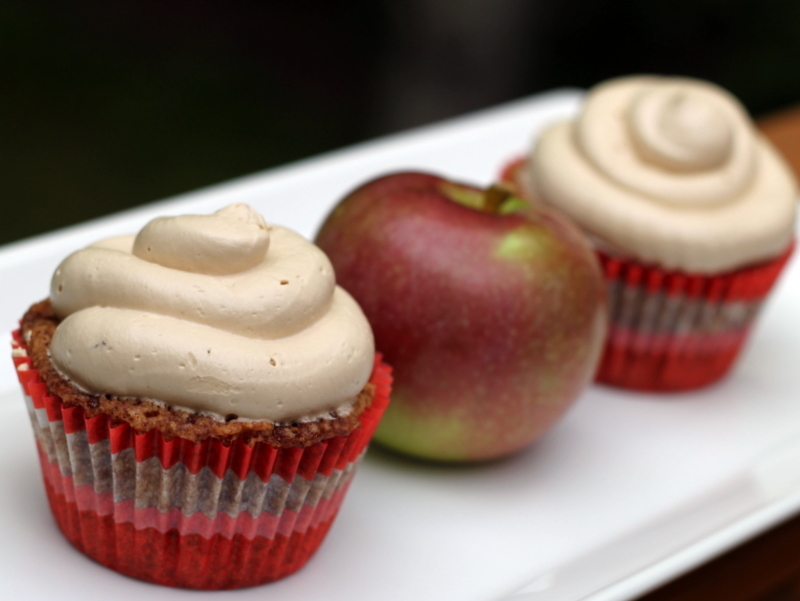 Ok, enough with the savory recipes, it is time for something sweet around here! 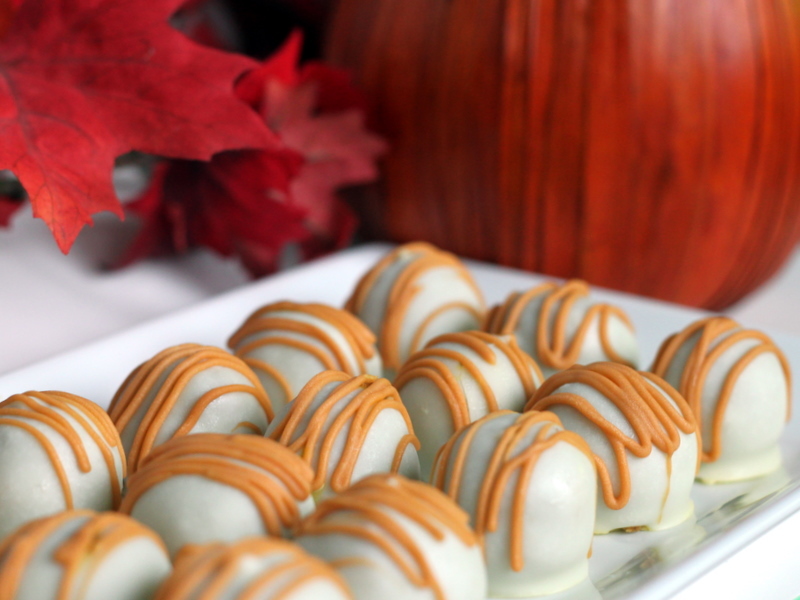 Something sweet, but still a bit summery for these last couple of days before fall. Have you heard of blueberry boy bait? It is a delicious dessert (or yummy breakfast) that is said to have originated back in 1954. The story is that a 15 year old girl placed in a Pillsbury baking contest with this recipe and its magical powers for “baiting” boys. Cute story, right?! I made an updated version of the 1954 recipe from Cook’s Country, and it was a huge hit with my family and coworkers! 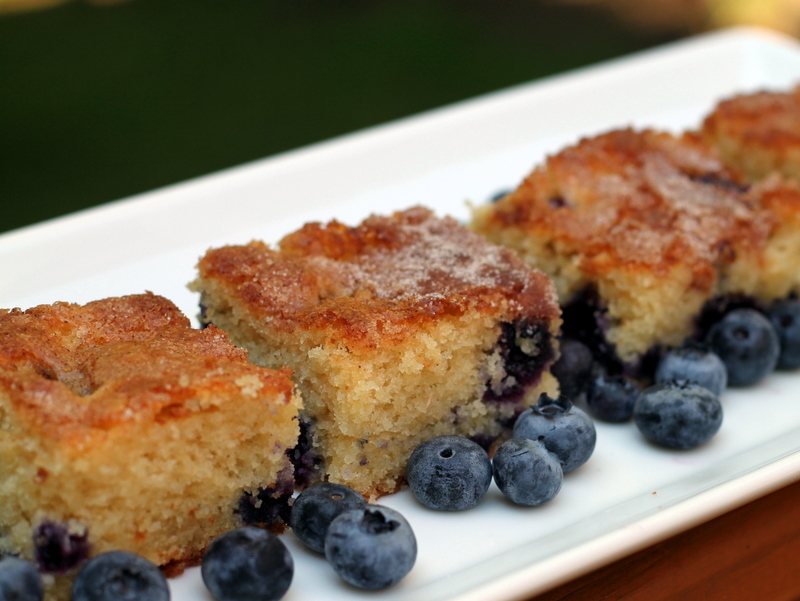 The cake itself is not overly sweet and the flavor of the blueberries really shines through, and the cinnamon-sugar topping adds a coffee-cake feel to this recipe. You can make this with frozen blueberries, but I would recommend making it soon while you can still get good, fresh blueberries! One more thing, be sure to check back soon as I have a big announcement coming! Whisk 2 cups flour, baking powder, and salt together in medium bowl. With electric mixer, beat butter and sugars on medium-high speed until fluffy, about 2 minutes. Add eggs, one at a time, beating until just incorporated. Reduce speed to medium and beat in one-third of flour mixture until incorporated; beat in half of milk. Beat in half of remaining flour mixture, then remaining milk, and finally remaining flour mixture. Toss blueberries with remaining 1 teaspoon flour. Using rubber spatula, gently fold in blueberries. Spread batter into prepared pan. Source: Cook’s Country, as seen on Brown Eyed Baker. During my last trip to the Farmer’s Market, I noticed a new vendor selling homemade goat cheese. She had all kinds of wonderful flavors from sun-dried tomato to rosemary, and even a red wine flavored log. I chose the roasted garlic flavor and when I got home and sampled it, I was extremely glad I did! 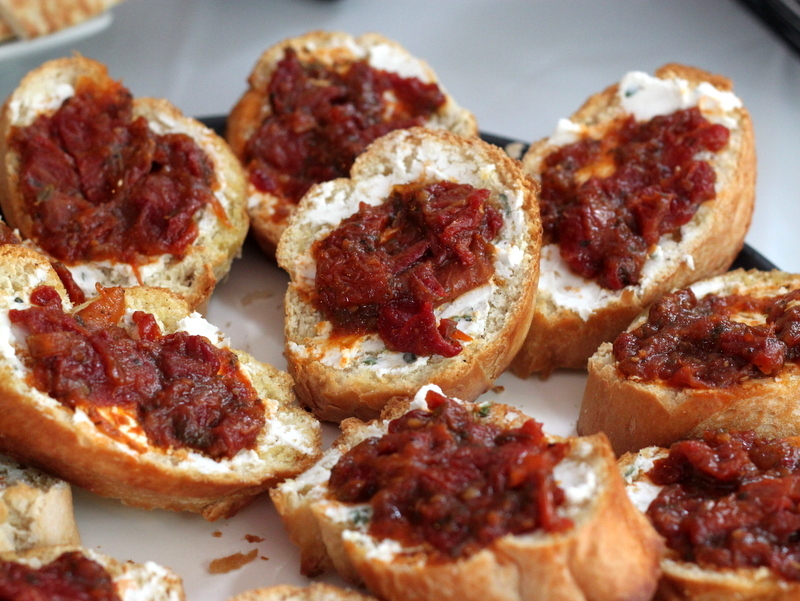 Unfortunately, I am the only one who likes goat cheese in my family, and while I could eat it spread on some crusty bread all day, I needed to find some other ways to enjoy it! Now that it is getting cooler, I don’t mind running my oven and roasting asparagus is my favorite way to prepare it. So when I saw this recipe, I knew it was perfect! This is an extremely delicious and very easy pasta dish to prepare. 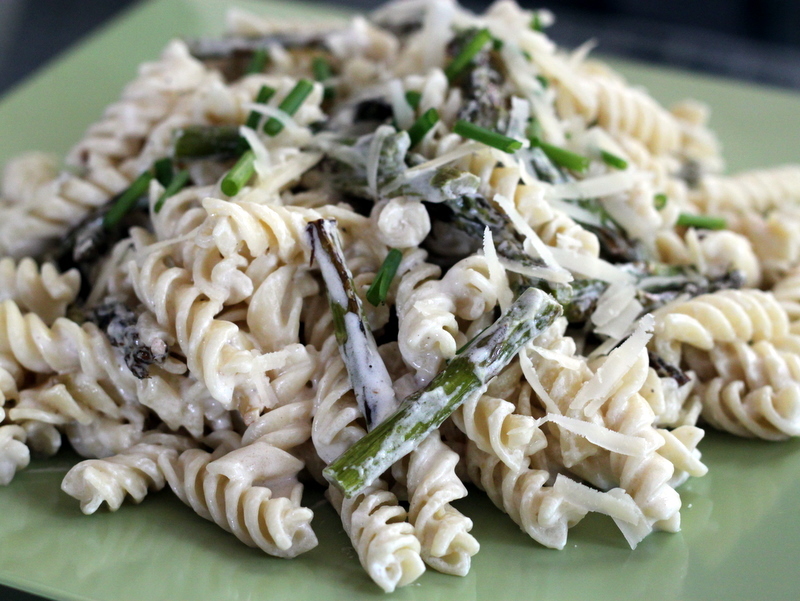 The roasted asparagus and garlic compliment the tangy goat cheese, and the pasta pulls the meal together. I enjoyed this as is, but it would also be delicious with some grilled chicken mixed in. Preheat oven to 450 degrees. Bring a large pot of water to a boil for pasta. Place asparagus on a large rimmed baking sheet, along with garlic cloves. Drizzle with olive oil, and season with salt and pepper. Toss to combine. Roast until tender, tossing occasionally, 12 to 15 minutes. When cool enough to handle, cut asparagus into 2-inch lengths and remove garlic from paper skins. While asparagus is roasting, generously salt boiling water. Add pasta, and cook until al dente, according to package instructions. Set aside 1 1/2 cups pasta water; drain pasta and return to pot. Crumble goat cheese into a medium bowl, add 2 tablespoons butter and the roasted garlic cloves and mash with a fork to combine. Add 1/2 cup pasta water and whisk until smooth. Season with salt and pepper to taste. Add goat cheese mixture and asparagus to pasta; toss to combine, adding more pasta water if necessary for sauce to coat pasta. Serve pasta garnished with chives and Parmesan. I am sure I will be posting many more appetizers and finger foods this football season, so stay tuned! What do you do when you get a less-than-stellar bag of fresh corn on the cob? Whine and complain that corn season is coming an end you make creamed corn! When it is at its peak, we have phenomenal fresh corn on the cob in New England. It is so sweet and perfectly tender, we could eat it every night with dinner. Unfortunately, during my last trip to the Farmer’s Market, the corn I bought was somewhat starchy and not nearly as sweet as it usually is. It wasn’t terrible, but it did not live up to my expectations for fresh summer corn. So rather than waste the remaining corn I had purchased, I made this recipe! Even if you don’t like creamed corn, this is not your average out-of-the-can recipe and you should definitely give it a try! 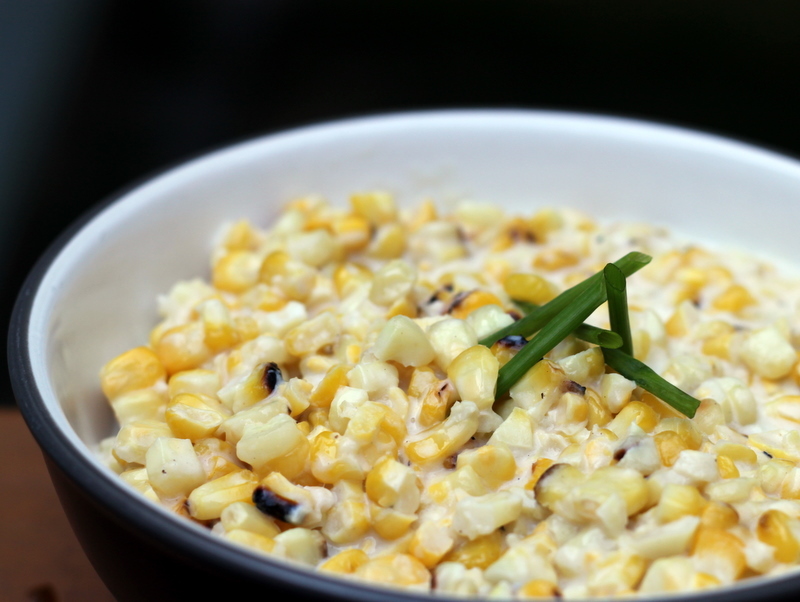 First you grill the corn, which adds a wonderful smoky flavor, then you mix the kernels with a very simple cream cheese sauce. 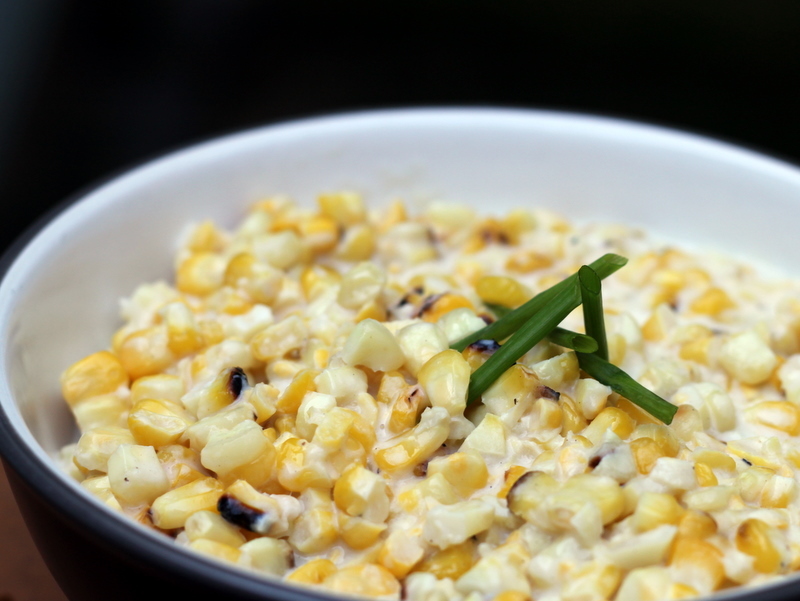 The sauce compliments the corn, without over-powering it, and the end result is a delicious side dish. I saw this recipe on Macaroni and Cheesecake, where she has instructions for roasting the corn in the oven, something we will definitely be trying this winter. Preheat a grill to medium-high. Arrange the corn on the grate and grill, turning occasionally, until the kernels are golden-brown and softened, 8 to 10 minutes. Once cool enough to handle, remove the corn kernels from the cobs; discard the cobs. (You should have about 5 cups kernels.) Lower the grill temperature to medium if you plan to complete the corn on the grill. Heat a large cast-iron skillet over the grate, or over medium heat on the stove-top. Add the butter to melt, then whisk in the flour until combined and foaming, about 2 minutes. Gradually whisk in the milk and cream cheese and cook, whisking constantly, until smooth and thick, 2 to 3 minutes. Stir in the corn kernels; season with salt, black pepper and the cayenne, if using, and cook until heated through, about 1 minute. If the sauce is to thick, add additional milk as needed. Source: Everyday with Rachel Ray, as seen on Macaroni and Cheesecake. I know the weather is getting cooler and fall is just around the corner, but I plan to take advantage of the final days of summer and use my grill as much as I can! I have made this recipe many, many times this summer, and it is always delicious! The garlic and lime in the marinade combine to create a tangy and flavorful chicken breast that is anything but boring. Add this to your menu this week, while the weather is still warm! In a shallow dish combine garlic, lime zest and juice, oil and salt. Whisk with a fork to combine. 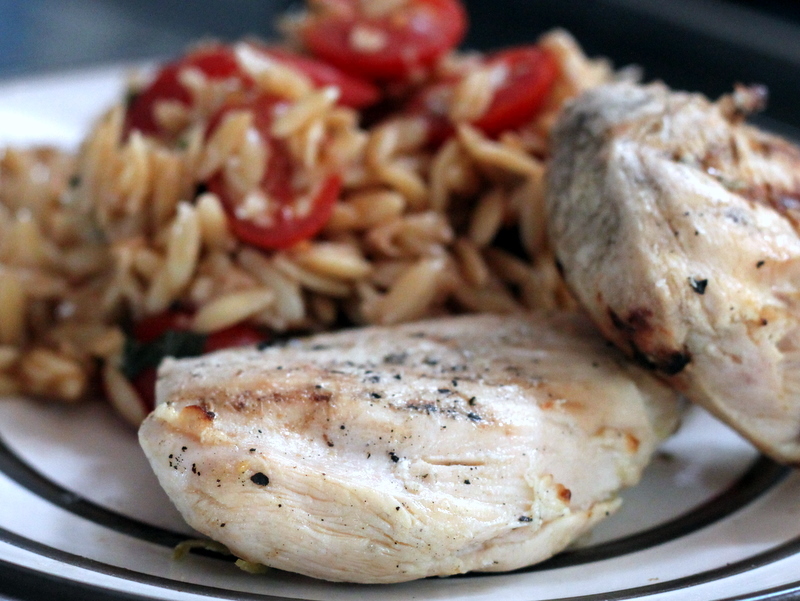 Pound chicken breasts with a meat mallet until they are of even thickness and cut each breast in half, giving you four pieces of chicken. Add the chicken to the dish, turning to coat with the marinade. Cover and refrigerate for 2-4 hours. Preheat the grill to medium-high and lightly oil the grates. Grill the chicken for 3-5 minutes per side, depending on thickness. The chicken is done when the internal temp reaches 165 degrees and the juices run clear.